Pearl Jam chooses the songs that close their records very carefully. They are always ‘statement’ songs that sum up or illustrate in some important way the most important themes of the album, the final take away message that the band wants to leave the listener with. And so the song they chose matters. Love Boat Captain or I Am Mine could have closed Riot Act, but if they had we’d be listening to a different record with a different message. So what Parting Ways tells us what the band hoped we would walk away from Binaural with. I’ve been arguing throughout this thread (and there has been pretty broad agreement on this—this is not something I can claim ownership for, I’m just the one saying it first) that Binaural is a record about the loss of agency, about feeling trapped and powerless, isolated and alone, without really understanding why. In fact, it’s the inability to understand why that makes it so maddening. You can’t emancipate yourself from your prison until you learn to see the bars of your cage (Daniel Quinn still would have been fresh in people’s minds, and this is one of the central messages from his books). This is before Eddie got involved in Nader, so there’s not that brief upsurge of optimism that would need to be crushed to get the defeatism of Riot Act. But this isn’t just a sense of political powerlessness that runs through the record. Although they usually manage to phrase this without the crassness of Love Boat Captain, the core emotion that runs through all of Pearl Jam’s records is love. Without love you don’t have solidarity, community, or the strength to endure. These other problems cataloged throughout the record all feel so big and so overpowering because the subjects of Binaural feel alone (thin air is the exception here, but it’s an exception that proves the rule). And so even though more of the songs on Binaural are about political or social themes than relationships, they end with love because this is where any attempt to pick up the pieces has to begin. As befitting this record, Parting Ways is one of the more atmospheric love songs in the catalog. The guitars manage to feel fuzzy (warm) and distant (cold) at the same time. 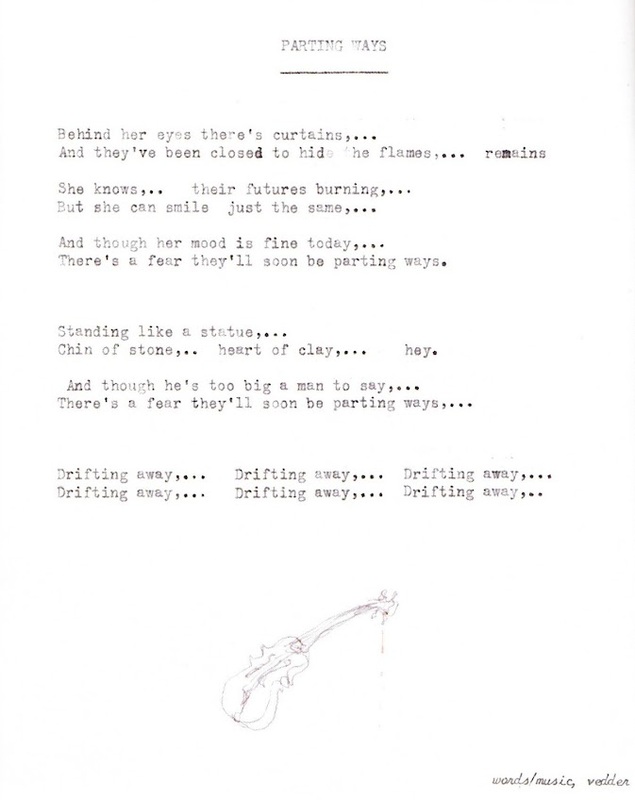 There is a gentle drifting melody that gets punctuated by harsher discordant moments, especially every time the parting ways lyric is mentioned. The strings manage to enhance the mood without sounding overwrought, which is hard to do since strings in a sad love song are such a rock music cliché. Eddie sounds distant and manages to walk the line between boredom and disengagement like a champion. He can’t over commit to the song given the subject matter (parting ways can’t be sung like black) but he still has to sound like he previously cared—that the connection between him and the person he’s singing about was once strong, and while there’s a wistful remembrance to the delivery (he can recall those feelings intellectually) he just doesn’t feel those things anymore. They’re drifting away, but remain just close enough so that he knows he should be troubled by it. It’s a very intellectual delivery in that sense—knowing what emotion should be there but not quite feeling it. The lyrics match the delivery perfectly. There’s this superficial sense that everything is fine, but things are fine only because the subjects refuse to confront what’s wrong. It’s probably because they don’t know how to fix it (there’s a fear they’ll soon be parting ways. Neither side wants this) and because it’s easier to smile and pretend everything is fine, but the costs are real, and the images reflect that (behind the chin of stone is heart of soft, malleable clay, the curtains in the eyes are closed so neither person has to confront the fire that’s hidden there, the needs and desires that go unmet). Parting Ways, in that sense, is a song about the costs of lying. We cannot be there for someone else unless we’re open and honest, and if we cannot be there for others we cannot be there ourselves. The subjects of the song are not just drifting away from each other. They’re drifting away from themselves, floating and lost in the void of Binaural. In a world defined by alienation, it is easier to die the slow death then fight to get it back again. Parting Ways, and Binaural, want to remind us that gradual decay is not an escape. It’s not a life. It’s just a muted death. And so Binaural, more than any other record in the bands catalog, is a cautionary tale. Its answers are negative. Its anthems are warnings. And that’s what makes it unique.